Tots N' Weenies have been trading since 2003 firstly in Coulsdon and now in Caterham, Surrey. 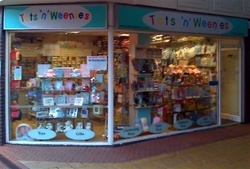 We started primarily selling baby and children’s clothing but have now branched into a wide range of gifts for the New arrival or his/her Christening or Naming day, wooden and soft toys, bedding, safety items feeding sets and many other items, most of which are available in the shop and on our web site. We even have gifts for the new Mummy & Daddy, Grandparents and big brother or sister. Now we have a second shop called Tresure Chest in Croydon Road, for toys and other products, where the same care in choosing children's products is taken. As a business we deal with only reputable companies such as Clippasafe, Rainbow Designs, Orange Tree Toys, Manhattan Toys, Gund. East of India and many more, giving us a varied range of items in our shop andthrough the web site. Enter Church Walk Shopping Centre from Station Aveneue, or Morrisons's car park, off Harestone Valley Road.